Hundreds of anti-Kremlin demonstrators have held a rally in St Petersburg, a day after a protest in Moscow ended in scuffles and arrests. The participants gathered at a square in the city centre, but were encircled by a similar number of riot police and prevented from marching. Smaller groups clashed with police after the main rally finished. Several opposition leaders were arrested. Ex-chess champion Garry Kasparov was among 170 held in the Moscow march. 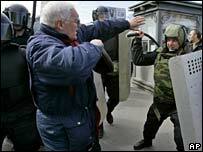 Mr Kasparov was freed several hours later after being fined $40 (£20) for public order offences. The protesters, allied under the Other Russia coalition, say President Vladimir Putin is stifling democracy. Reports say Eduard Limonov, leader of the radical National Bolshevik party, and several other organisers were arrested. A number of participants had been detained on arrival in the city, including the leader of the Pora youth movement Andrey Sidelnikov and Olga Kurnosova, the local head of Mr Kasparov's United Civil Front. A reporter for the private Moscow Echo radio station said before the rally that he saw interior ministry troops and a water cannon in the city, adding that people could be forgiven for thinking a military operation was about to start. Demonstrators were seen holding flags of various groups including that of the liberal Yabloko party and the hammer and sickle banner of the National Bolsheviks. But correspondents say the turnout was not as good as the organisers might have hoped. Organisers contemplated whether to try to march down the city's main street, but were blocked by police and began to disperse after two hours. One group of demonstrators who avoided the encirclement tried to march but were stopped at a nearby railway station, where scuffles broke out with police, local media said. Reports say several people were beaten by police, including an elderly man. Russian authorities sanctioned the rally but banned any marching. President Vladimir Putin denies the opposition charge that he is trampling on democracy, accusing the opposition of destabilising Russia. In Moscow on Saturday, a huge security operation, including more than 9,000 police, was launched to prevent protesters from gathering at Pushkin Square. After being released Mr Kasparov said: "It is no longer a country... where the government tries to pretend it is playing by the letter and spirit of the law."